Neuroscientists at the Salk Institute for Biological Studies in La Jolla, CA, have found that providing mice with an enriched environment actually stimulates an increase in the number of their brain cells. Mice housed in a large cage containnig tunnels, colorful toys, an exercise wheel and hidden treats performed significantly better on subsequent behavioral tests than mice living in smaller cages containing only food and water. When the scientists looked inside the heads of these smarter mice they found an increase of 40,000 nerve cells in the hippocampus, a highly-specialized brain region involved in learning and memory. This 15 percent gain in nerve cells is believed to result from an enriched environment fostering the survival of new brain cells. The mice that enjoyed a life with toys and exercise had a 60 percent higher survival rate of new-born cells. These results are especially intriguing because the experiment used older animals rather than infant mice whose brains would still be developing. Therefore, at least with mice, mental stimulation during adulthood can still affect the brain's structure and most likely increase learning ability. This is not only exciting for roden lovers but also for those interested in other species. Cornell University researchers have found that the brains of different mammals are much more alike than was previously thought. Therefore, what holds true for mice may quite possibly hold true for other animals, say, horses. The horse's brain is comparable in size to that of humans. It has an extraordinarily well-developed cerebral cortex consisting of many convolutions (folds that increase the surface area). The hippocampus is a composite convolution of the cortex which is the thinking part of the brain responsible for intelligence and memory as well as other functions. Even if your horse's previous care and management was not idea, this does not mean he will not be a good learner. The Salk study showed that brain enrichment may occur anytime, not just in the formative years. So, it's never too late to help your horse reach his maximum mental potential. The more a horse's brain is stimulated, the quicker he learns new things. The best way to keep a horse's brain active is to provide him with variation in his environment and his activities. Vinur learns to make music. Vinur learned how to play the piano today! to figure how to stay ahead of him! of the game was to make the "piano" make noise. he targeted it, but didn't get CT'd. his top lip to plunk a key. when he licked the keys all in a row with his tongue! The antithesis to the California mouse study is provided by a group of New York researchers. They found that stress can decrease neuronal cells in the hippocampus. Neurogenesis, or the birth of new brain cells, was completely halted when shrews were exposed to stressful episodes. These two studies show that this area of the brain is dynamic and it's quality can be pushed in either direction. The horse must be at the top of the list of animals confronted with daily stress due to improper management. True or false: Horses cannot transfer information from one side of the brain to the other. For example, if they’re going down a trail and they see a mail box out of only one eye and they get spooked at that, then come back the other way and see it with the other eye, they won’t recognize it as being the same thing. So they get spooked again. They see more than you think! There are many myths suggesting horses have limited intelligence The answer? False, says Dr. Evelyn Hanggi, horse intelligence researcher in Aptos, California. In fact, this is just one of the common misconceptions about horses that Hanggi, founder of the Equine Research Foundation, is working to refute. Horses are trusted to do some dirty work. They carry riders over difficult terrain. They act as draft animals. They make a lot of money for their owners if they can win races – but they’re put down if those races cause them serious leg injuries. Horses are beloved for their beauty, power and speed, and their ability to share some of that with us. But we don’t pay a lot of attention to their brains. Horses are reknowned more for their muscles than their mental abilities. But Hanggi thinks we should. A biologist and chemist who specialized in animal intelligence research, Hanggi began looking at horses because, as a horse owner, she was interested in the higher cognitive ability of her animals. But when she made the decision to study horses, she discovered that no one else really had done that before. 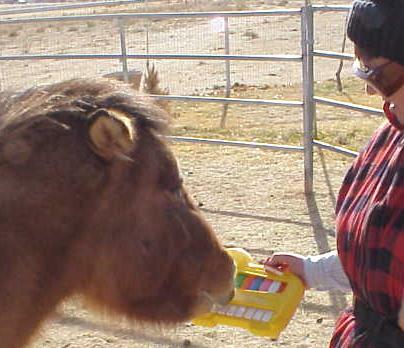 Dr. Evelyn Hanggi wanted to test horses' cogintive abilities . With her associate, Jerry Ingersoll, Hanggi established her Foundation. The foundation is devoted to the search for signs of higher intelligence in the heads of horses. Her research, which has been published in the Journal of Comparative Psychology and the Journal of Equine Veterinary Science shows that horses are much more complex and intelligent than they’re given credit for. But how do you find out what a horse thinks? Hanggi has designed non-invasive tests that use positive reinforcement – like food rewards – to see what horses know. For instance, Hanggi wanted to explode the myth that horses can’t transfer information from one side of the brain to the other because the two sides aren’t connected. The theory didn’t make sense to Hanggi because anatomy shows that the two sides of the horse’s brain are connected. So she set up a board with two openings in it that revealed different shapes. Then she blindfolded one of the horse’s eyes. Another aspect Hanggi tested was on “categorization learning”. With the same board, Hanggi and her team would show the horses different shapes –- some solid and some with an opening in the centre. That type of sorting allows an animal to categorize food and non-food plants, or predators and non-predators, or can be applied in the training of horses. The results were impressive. Each time they reversed the test, the horse made fewer and fewer mistakes, until it got down to just one mistake. It would choose the circle, get the reward, choose it again, not get the reward -- then immediately choose the square. In other words, they learned very quickly. Vinur is being asked to "touch" the color "blue". Do horses enjoy jumping? We may never know But how intelligent is that – relative to other animals, or even humans. Hanggi is reticent to make such comparisons, saying it’s like apples and oranges – animal species have different strengths depending on what they need to survive. But she does say that horses who are not given enough mental challenge – horses kept in stalls all day, or given such similar show tasks every day that they become mind-numbingly bored – develop problem behaviours. Hanggi advocates something called “natural horsemanship” to avoid these problems. Can horses ever enjoy the work we put them to? Hanggi’s study, “Categorization Learning in Horses” appears in the 1999, volume 13, no.3 issue of the Journal of Comparative Psychology. “Interocular Transfer of Learning in Horses” appears in the Journal of Equine Veterinary Science, volume 19, #8. For more on horses and Hanggi’s research, check out her monthly column, “Horse Sense” in Horse Illustrated Magazine. Or visit the Equine Research Foundation website. A recent series of articles in the Chicago Tribune described in detail the development of the human brain as it has been discovered through several serious research efforts. The findings reported were fascinating but not surprising to those of us who have long believed that the early years of life have the most impact on eventual human potential. One of the most basic findings of the study was this: An infant's experiences actually develop his brain. Sensory experiences (hearing, seeing, touching, feeling, tasting) actually teach brain cells their jobs. A lack of such sensory experiences results in brain cells failing to make connections and eventually dying off. If a child lies in a playpen all day, he is experiencing a limited number of sensations. He will not have many new experiences through which he can establish new brain connections. Unfortunately, these connections must be made in infancy. A person can not go back and "redo" these experiences. The first four years of life are when the brain is "built." Babies who have more sensory experiences are able to develop more brain power. Dr. Frederick Goodwin who is the director of the National Institute of Mental Health participated in some of this research. His conclusion? "Your can't make a 70 IQ person into a 120 IQ person, but you can change their IQ measure in different ways, perhaps as much as 20 points up or down, based on their environment." In essence, an infant born with a 100 IQ can either become an 80 IQ or a 120 IQ by his fourth birthday, based on the poverty or enrichment of his experience base! Another important finding of one study details the effect of a stressful environment on infants and toddlers. Young children exposed to a steady diet of stress lay down abnormal connectors in their brains because of high levels of stress hormones such as cortisol and adrenaline These abnormal connectors set up aberrant networks of connections, causing the child to learn violent responses to benign stimuli. These networks create a brain which is designed for "fight or flight" which may lead an individual to violence and other inappropriate responses. Megan Gunnar, a child development psychologist at the University of Minnesota, has found that some children from stressful environments are able to "neutralize" their stress through a caring parent or an involved adult. "The things that are associated with resiliency have to do with protective factors like the quality of home life, the parent-child relationship or another relationship that provides some security for the child." The implication of this research is exciting for parents: There is biological evidence that the environment and nurture they provide for their children can have a powerful impact on the child's developmental potential. Maybe our grandparents said it best: The hand that rocks the cradle rules the world! Regular running and intensive mental exercise may revitalize the mind by spurring the growth of new brain cells responsible for learning and memory, new animal experiments suggest. The research, made public Monday, sheds light on how the effects of daily experience can foster new brain cells in adult mammals from mice to human beings. In essence, the research suggests that an active life--whether the activity be physical or mental--can have a positive impact on the brain. In separate studies published in Nature Neuroscience, scientists at the Salk Institute for Biological Studies in La Jolla and at Princeton University discovered that some kinds of physical and mental exercise promoted the growth of new neurons, while also measurably prolonging the survival of existing brain cells. The changes took place in a part of the brain called the hippocampus, which is crucial to the formation of new memories. "That is terribly exciting, given that we know the hippocampus plays a role in the memory of new facts and new events," said Neal J. Cohen, a cognitive neuroscientist at the University of Illinois. "It is clear the adult brain continues to be modified structurally and functionally by experience." The Salk researchers, to their surprise, found that adult mice exercising on a running wheel regularly developed twice as many new brain cells in the hippocampus as mice housed in standard cages. The scientists had designed their experiment to test the effects of learning and had only included the running wheels as one of several different variables. The mice ran at their own pace, as often and for as long as they liked. "The difference was so striking," said neurobiologist Fred H. Gage, senior author of the Salk study. "And because we know now that human brains also make new cells, it just might be that running or other vigorous exercise stimulates brain cell production in people as well." Until recently, the idea that the human brain can produce new neurons well into old age was a scientific heresy. Most experts were convinced the human brain had done almost all its growing by the time a child was born. But several animal studies have shown that, contrary to expectations, the hippocampus of the adult brain can produce thousands of new neurons every day. Recently, Gage and his colleagues demonstrated that the human brain is no exception, producing new neurons even in the elderly. The Salk researchers do not know why running should have such an enhancing effect on neural development. Running might increase the flow of oxygen and nutrients to brain tissues or release special growth factors that promote new neurons, Gage said. It may well be that the primordial biology of running prompts the nervous system to prepare for an onslaught of new information as an animal navigates unfamiliar terrain in the pursuit of prey or in flight from an enemy. In those situations, the brain may respond reflexively to running by expanding its store of neurons in anticipation of new learning, several experts said. "Exercise itself over the eons may have become associated with a bunch of effects that help the brain prepare itself for new information, new learning, new brain work," Cohen at Illinois said. In their experiments, the Princeton team found that purely mental tasks could double the number of new neurons in the adult hippocampus and help existing neurons live longer. Mental challenges that required the animals to master information involving spatial relationships and timing, which placed special demands on the hippocampus, had the greatest effect. The lab mice, for example, had to learn how to locate platforms in a water maze, which tested their ability to put together spatial relationships. Learning tasks that did not place demands on the hippocampus had no effect. "It is a classic case of 'use it or lose it,' " said Princeton psychologist Elizabeth Gould, who conducted the research. "Certain types of learning that require this brain region--the hippocampus--were very good at rescuing new neurons from death. It was not just learning in general. It was not experience in general." Although the Princeton research was not intended to address human well-being directly, the animal experiments underscore the importance of an active life of the mind, Gould said. "It is very likely if you lead a very mentally active life you are engaging the hippocampus," Gould said. If the right kind of mental exercise promotes a healthy mind, the absence of mental stimulation may have an equally harmful effect on the brain, by allowing neurons to atrophy and die. "A lack of learning opportunities may have a negative structural impact on the brain," Gould said. Together, the findings hint at the physical mechanisms underlying the human brain's unexpected "flexibility," its ability to change in response to experience. Previous studies have shown that animals, including primates, created more new cells in the hippocampus if they lived in a more stimulating, enriched environment rather than in a standard cage. In the new research, the two teams of scientists were trying to pinpoint the tasks most likely to spur new brain cells. "I think it is a pretty big deal," said neuroscientist Janice Juraska at the University of Illinois, who studies brain development. "It helps explain why we are as flexible as we are."